This is a reader question from Susan who will be renting a car and wants to know about the safety of renting a car seat. As Susan knows, I've written much about this subject, including two investigations of unsafe car seats at rental car agencies. I've also heard from many readers who have had bad experiences at rental car agencies around the country. I came across your blog b/c i am traveling with my 3 month old baby to Boston. Thanks so much for all the great information. It's a short flight, but I will need to rent a car. I read one line where you say you had a "fine" experience with Hertz. Do you think all Hertz rentals have updated and clean car seats? Should I take my own just in case? On their website they say they offer Graco Snug ride seats and Costco convertible seats. I am a AAA member so the infant seat rental was actually "free." What is your opinion on whether I should take my own or hope that Hertz has good infant seats? Thanks so much for writing. I'm glad that my website was helpful to you and I hope you have a great time in Boston. Through my readers, I have heard stories of unsafe or dirty car seats (or no available car seats at all) at every major rental car chain. It's no fun to get trapped at the airport without a safe car seat for your child, so I think the safest bet is to always bring your own seat. Here are a few ideas that could help make your trip with the car seat in tow a little easier. Consider checking your car seat. Most airlines do not charge a bag-check fee for car seats, but be sure to check your airline's policy in advance. Baggage (including car seats) is often left outside for brief periods of time (even when it is raining or snowing) so make sure that it is protected in a bag. The safest choice is the car seat's original packaging, which will also help protect the car seat from damage. Another option is to stow your car seat in a large plastic garbage bag. Finally, there are several high quality carseat bags to choose from, and many families are able to ship additional items that fit in the bag along with their carseat. As with all luggage, make sure that your car seat is clearly labeled to help the airline find it should it be misrouted. Finally, if you travel frequently, you could consider buying a travel car seat. If you absolutely must rent a car seat, following the advice on this page: Safety Tips for Renting a Carseat will help increase your odds of getting a safe seat. andrea on June 23, 2009 at 4:48 a.m. I do think in fairness I should say that we have rented a car seat many, many times and have never had a problem at all, and have, in fact, always received new seats. So while I am sure there are problems not everyone has had a hard time. We have also had a car seat broken while checking it as baggage, so that is always a risk you take as well! Kara Turner on June 23, 2009 at 12:37 p.m.
Linda on June 24, 2009 at 3:26 p.m. Personally, I'd be hesitant to check a seat. Baggage carriers aren't particularly gentle with luggage and other items--do you want them throwing your carseat around, throwing things on top of it, etc.? The safest for your child is to use your carseat on the plane (it may not help in a crash but will protect them in turbulence) and then you'll have it when you get there with no worries. Amy at www.pitstopsforkids.com on June 25, 2009 at 10:21 a.m. I'm glad you posted this question. In 2005, I made the mistake of renting a car seat from a major rental company (I can't remember which one now) and was horrified to see it was cracked straight down the middle underneath the (dirty) cover. When I asked for another seat (and that this one was discarded from the inventory) I was told it was the only one. We ended up renting the car, one of us driving to the closest store, buying a new seat, and bringing it back. As one commenter says above, I am leary of checking car seats, too, because of aggressive baggage handling, but I have when necessary in the past. My first choice when traveling is to gate check, even if it means lugging around an extra piece of baby equipment through the airport. dalewhither on July 6, 2009 at 11:52 a.m. 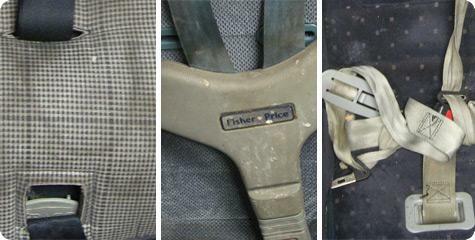 I don't think its a good idea to rent a car seat, because the used car seats may not be in a perfect condition. You may face problems while installing the old car seats. Instead of renting an old one its a good idea to buy a toddler car seats which are available at a cheaper price. stanleytylor on July 8, 2009 at 5:16 a.m. The Convertible car seats are the best option. These car seats are easy to install and remove. We can install the convertible car seat by just reading the user manual. Make sure whether the seat strap is in good condition which helps in keeping the baby safe. Mel Espinet on December 14, 2014 at 1:48 a.m.
Esmi Johnson on August 17, 2015 at 12:20 a.m.